What is your perfect chicken salad consist of? Is it sweet or savory? Crunchy or…not? 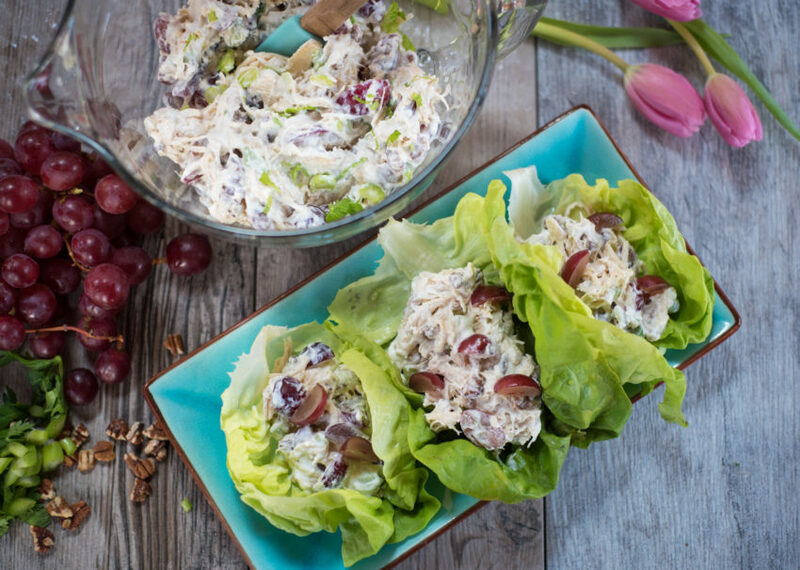 I think chicken salad is like an art…there are a few simple things to making it perfect. 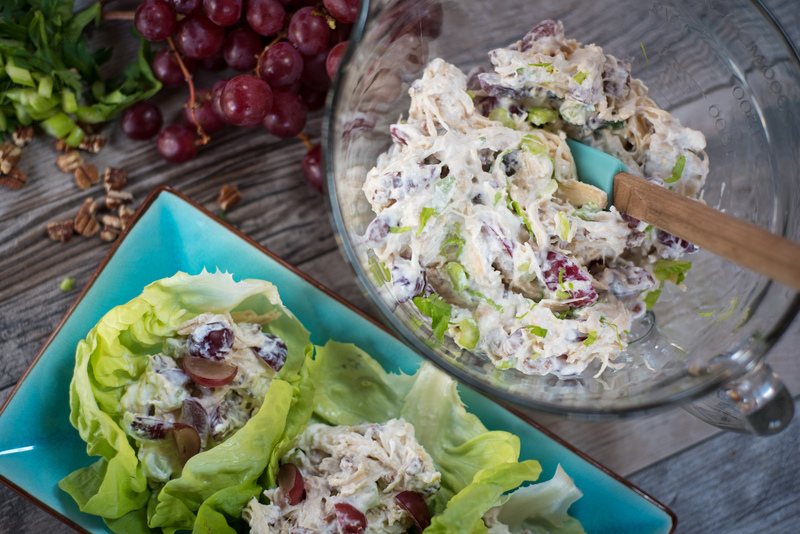 And this one is my favorite version ever: I think chicken salad is best when it has a sweetness of fresh, juicy red grapes, and a crunch of pecans. And, if you prefer, a little snap of celery. That’s optional though. There are a few secrets. First, you must squeeze in the juice of 1/2 lemon. Acid in that lemon helps to cut through the heavy mayo feeling. Then, the pecans MUST be toasted. 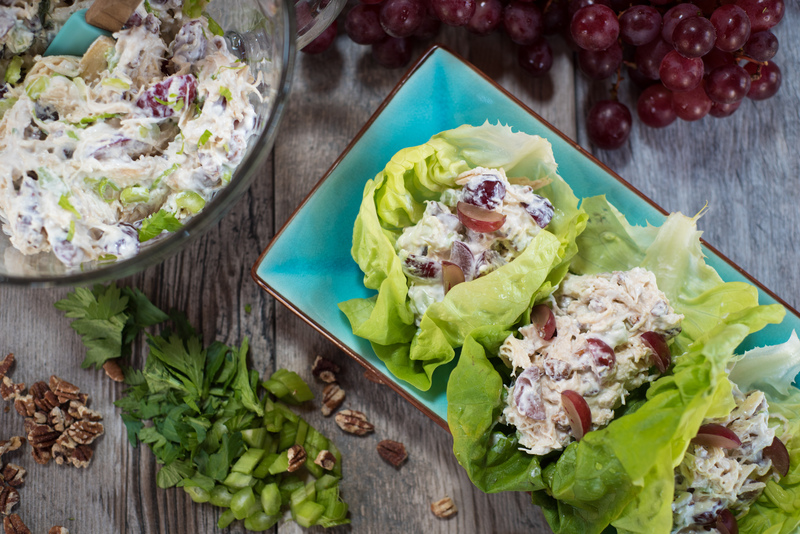 Don’t even try this chicken salad without toasting the pecans. Promise me? Thank you. And third….thin it out with a little warm water. Just a few tablespoons, but that can make all the difference and help to marry the flavors. 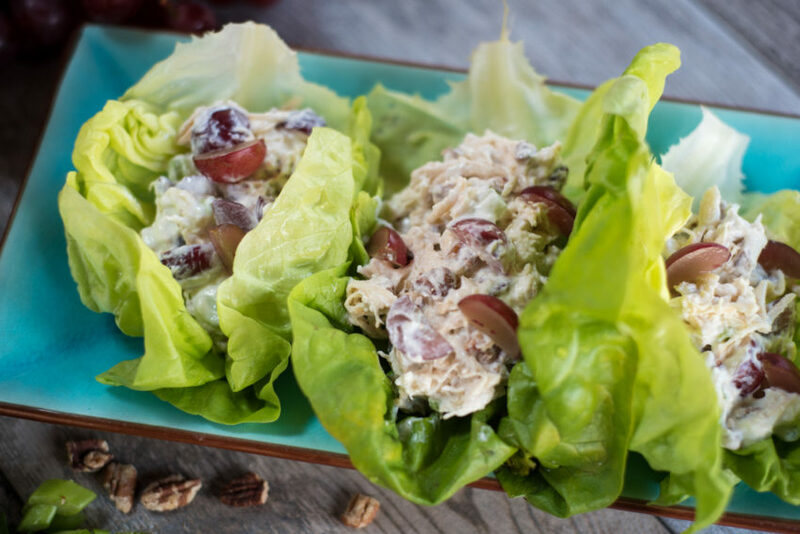 I love to stuff this chicken salad into a butter lettuce leaf, or just fill a mug with it and call it lunch…. 1. In a mixing bowl combine all ingredients. Add a couple of tablespoons warm water to thin the mayonnaise out. Fold together. If needed, add a couple more tablespoons water to get the right consistency. 2. Place the chicken salad on a lettuce wrap or in a mug, and enjoy! Use within 3 days. Annessa, do you cook your own chicken or use rotisserie chicken for this? If you cook your own chicken, which method do you use to cook it? I am hoping this ends up being similar to the pecan chicken salad that Marsh used to sell in their deli. Great question, Terri! I usually cook it myself….by poaching. I boil 4-6 chicken breast (submerged in water), until they are cooked through. Remove, let cool a bit, and then shred! I also sprinkle a little kosher salt on the chicken as I’m shredding it. It’s delicious when the chicken salad is slightly warm because of the cooked chicken. Dovyouvhave anyother gluten free dsserts thatcdont have coconut in it .im allergic to almond and coconut.